Unique in representing so many of an ancient family in such a small parish, nine members of the de la Beche family lie in stately stone splendour in the little church of St. Mary’s, Aldworth. After Harold II and his house earls were defeated and killed on Senlac Hill, Hastings in 1066, Duke William of Normandy crossed the Thames at Wallingford and marched triumphantly on London. In the following years after the invasion, many of the Conqueror’s sympathisers and supporters crossed the English Channel in search of land and favours in the new Norman Kingdom. One of these was a knight from Flanders named de la Beche who, probably as a result of services given to the king, was granted licence to build a castle at Aldworth. 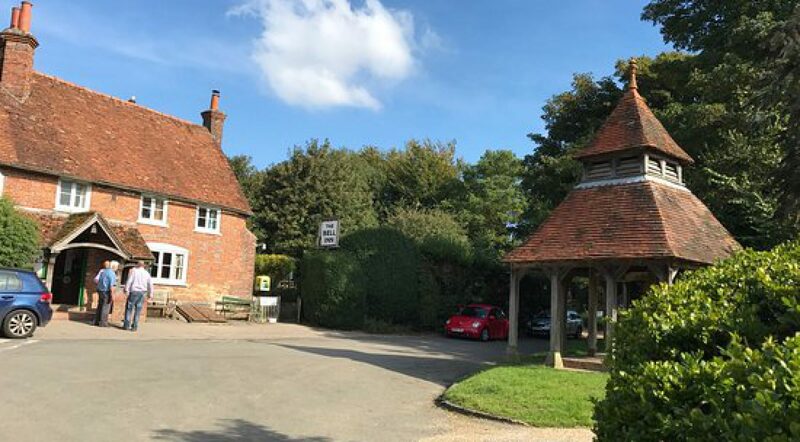 In addition to this he was given land and the right to build property near Swallowfield, Compton, Bradfield, Yattendon and a second castle at Mortimer. The Doomsday Book, compiled from 1086 onwards, records Aldworth as Elleorde and assessed the land value at one hundred shillings with tillage potential of five ploughs and woodland sufficient for ten swine. The inhabitants seem to have numbered not more than twenty-five souls, all of them simple folk, villeins, serfs and swineherd. 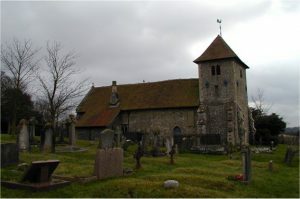 St Mary’s Church next to the centuries-old yew tree can always boast of a constant congregation, for within lie the last representatives of the de la Beche family. They seem to fill the church and lie in stately stone splendour either along the aisles under richly carved canopies, or upon tombs in the nave. There are nine of these effigies, so tall in scale as to be known as the “Aldworth Giants”, which are surely unique in the country in that they represent so many of an ancient family in so small a parish. First represented along the north wall is Sir Robert de la Beche, knighted by Edward I in 1278, his son Sir John, and in turn his son Sir Philip. Sir Philip is perhaps the most impressive of the effigies. He seems, because of his huge size, to be crushed into the niche, lying on his side, where he looks most uncomfortable. He wears a mantle over his embossed leather armour to signify that he was valet to Edward II and squatting at his feet there is a dwarf by whom he was always accompanied at court to show off his height to its best advantage. Sir Philip had six sons, – John, Philip, Nicholas, Edmond, Robert, Edward, – and one daughter, Joan. He was sheriff of Berkshire and Wiltshire in 1314 and together with his sons, took part in a rebellion against Edward II in 1322. With their leader Thomas, Earl of Lancaster, they were defeated at the battle of Boroughbridge, Yorkshire and were lucky not to lose their heads along with Lancaster. They were imprisoned for five years and their lands confiscated until the accession of Edward III in 1327, when they were subsequently restored to their former position. Sir Philip’s first son, Sir John, lies with his wife, Isabella, in the nave of the church together with his younger brother, Lord Nicholas de la Beche. Lord Nicholas became a man of much importance in the early years of the reign of Edward III. By 1336 he was seneschal or steward of the province of Gascony in France, Constable of the Tower and custodian of the King’s first son, Edward Prince of Wales, later the Black Prince. Lord Nicholas died in 1348, living just long enough to see the fulfilment of his duties in England and France, enjoy the glorious victory over the French at Crecy in 1346 and the personal glory that the Black Prince found for himself in the battle. Lord Nicholas’ elder brother Sir Philip, the second son of Sir Philip de la Beche, lies together with his mother, Lady Joan, along the south aisle of the church. Lady Joan appears as a graceful figure and the carving of her traditional dress carries the most painstaking detail of fold and shape. 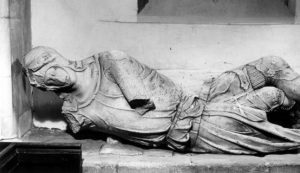 The last effigy is that of John, the son of Lady Isabella. He is badly mutilated and as records show we know he died in 1340 at the age of twenty. 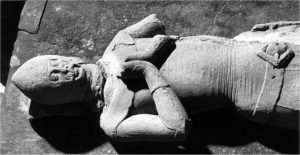 It seems likely that the effigies were made at the same time and presented by a de la Beche in the middle of the 14th Century just before the family became extinct in the male line. The damaged condition of most of the carvings, notably the headless Lady Isabella, her husband John and the limbless and headless young John, stems from the 1650s when an Act of Parliament passed by the Cromwell regime decreed “the demolition of monuments of idolatry and superstition”. It was too much for the curate, Thomas Longland, who was appalled by the sacrilegious acts of destruction committed by the people and had no alternative but to resign from St. Mary’s. The castle of de la Beche, long since vanished, by the crossroads at the Four Points, is now the site of the present de la Beche Manor, and it was here that the identity of the Aldworth effigies was confirmed. The site of the castle was being excavated in 1871 when a seal was discovered bearing the name of Isabella de la Beche. The seal is a beautiful piece of silver-work; perhaps the finest of its kind in the country. In 1968 it was sold to Reading Museum where it is on show. Symonds also says that the effigies were spoken of as “John Long, John Strong, John Ever Afraid, John Never Afraid”. 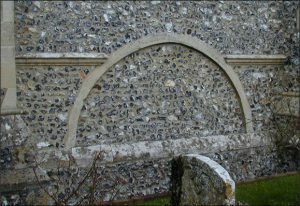 Obviously the presence of the de la Beches in Aldworth loomed large enough in the minds of the village folk for the legends of the members of the long dead family to be preserved.